In June, the AU approved a protocol to expand the authority of the African Court to include criminal jurisdiction over crimes against humanity, war crimes, genocide, along with a range of transnational crimes. The protocol includes a provision providing sitting heads of state and other senior government officials with immunity from prosecution. The protocol must be ratified by 15 AU member states before taking effect. The African Union (AU) meeting in the Kenyan capital on 25-26 August was held to promote the ratification of its treaties. The International Commission of Jurists-Kenya and Kenyans for Peace with Truth and Justice (KPTJ) told IPS that the inclusion of immunity for heads of state at the African Court is out of touch with human rights principles and designed to serve the interests of the powerful. 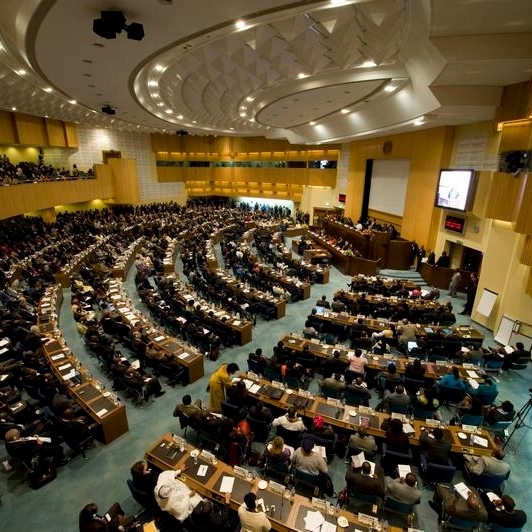 The AU has defended its members’ decision to approve the protocol’s immunity provision. The CAR formed a new transitional government. Despite a tenuous peace deal,thousands are still fleeing the country. KPTJ analyzed Kenya’s International Crimes Division, concluding that its jurisdiction is too wide and should be reconsidered. ICC judges ordered Prosecutor Fatou Bensouda toconfirm by 5 September whether her office will be ready for the start of the Kenyan President Uhuru Kenyatta trial on 7 October. Legal wrangles continue over requests to the Kenyan government to assist in providing the prosecution with access to Kenyatta’s phone, financial and land records. Nine prosecution witnesses compelled by ICC judges to testify in the trial of Deputy Kenyan President William Ruto and broadcaster Joshua Sang will reportedly do so via video link from Nairobi. The prosecution’s case is set to resume on 1 September following the ICC summer recess. A defense witness in the case has been missing for two years according to his family. ICC judges have reportedly ordered the prosecutor to release any information regarding alleged links between the Mungiki and former presidential candidate Raila Odinga. The UN Security Council extended the mandate of the AU-UN Mission in Darfur (UNAMID) for 10 months. Before the decision, Human Rights Watch called on the UN toimprove UNAMID’s human rights monitoring and public reporting in the wake of allegations that the peacekeeping force covered up attacks against civilians and peacekeepers. A former Janjaweed leader accused the governor of North Darfur of fuelling tribal clashes, while a rebel group accused the government of the same. The Sudanese military denied involvement in clashes between two tribes in East Darfur. The head of the Darfur Regional Authority said that the Sudanese military and police will soon begin integrating former rebels that have joined the peace agreement. Allan Ngari at the Institute for Security Studies looked at the ICC Office of the Prosecutor’s decision to withdraw its appeal of the judgment in the recently concluded trial of Congolese militia leader Germain Katanga from the perspective of victims participating in the case. ICC judges this week ordered the Court’s Registry to report on the possibilities for reparations to participating victims. The UN Security Council called for theneutralization of Rwandan rebels in the DRC. Victims of the Barlonyo massacre—allegedly committed by the Lord’s Resistance Army—demanded two trillion shillings in compensation from the government. Amnesty International condemned a public execution in eastern Libya as a symbol of the country’s increasing lawlessness. Meanwhile, Islamist militias overran Tripoli’s airport. Libya’s former parliament vowed to take alleged Egyptian and Emirati airstrikes on Tripolito the ICC. The UN Security Council adopted a resolution on Libya reaffirming the importance of cooperation with the ICC and extending targeted sanctions on human rights violators. The head of the UN Support Mission Inside Libya welcomed the ICC prosecutor’s statement that violators of serious crimes in Libya are liable to be prosecuted. A coalition of 22 NGOs, brought together by the International Federation for Human Rights (FIDH), called on negotiators involved in Malian peace talks to reject amnesty for international crimes. FIDHalso condemned the release of a Malian Islamist judge accused of human rights violations as part of the ongoing negotiations. The Economist cast doubt on the chances that the peace talks will be successful. Ivoire Justice interviewed a man who says he wants Laurent Gbagbo to be held accountable for the deaths of his wife and children during the 2010 post-election violence (in French). Colombia President Juan Manuel Santos called for a thorough investigation into allegations that the political party of former president Alvaro Uribe used classified intelligence to try to derail FARC peace talks. Georgia, the EU and NATO condemned the presidential poll held in Abkhazia. The newly elected Abkhazian president met with Russian President Vladimir Putin to discuss a new cooperation treaty. A coalition of civil society groups called on Nigeria’s president to investigate human rights allegations against security forces or else they will petition the ICC on the matter. The Boko Haram declared a caliphate in Nigeria. Nato, the UN and EU are holding emergency meetings after Ukraine’s president claimed that up to 1000 Russia troops had invaded the country. Ealier in the week, the International Committee of the Red Cross is said to have made a confidential finding that Ukraine is officially in a war, with consequences for criminal prosecutions according toanonymous sources. High Commissioner for Human Rights Navi Pillay has condemnedserious human rights abuses by all parties to the conflict in a new report. Hamas pledged to back any Palestinian bid to join the ICC according to the Associated Press. Meanwhile, Haaretz reported that Palestine plans to ask the UN Security Council to set a deadline for Israel to withdraw to its 1967 borders and will go to the ICC if the Council refuses. The International Justice Project analyzed the crime of aggression and what its activation would means for the ICC. Citizens for Global Solutions noted that a Global Centre for the Responsibility to Protect policy brief on North Korea advocates referring the situation there to the ICC. ASP President Tiina Intelmann visited Brazil, one of the ICC’s biggest member states, where she discussed the country’s support for the Court and the fight against impunity. Lebanon’s foreign minister briefed his foreign counterparts, as well as regional and international organizations, on his request for the ICC to investigate alleged crimes in Iraq. A UN panel found that public executions, massacres and torture have becomecommonplace in Syria.